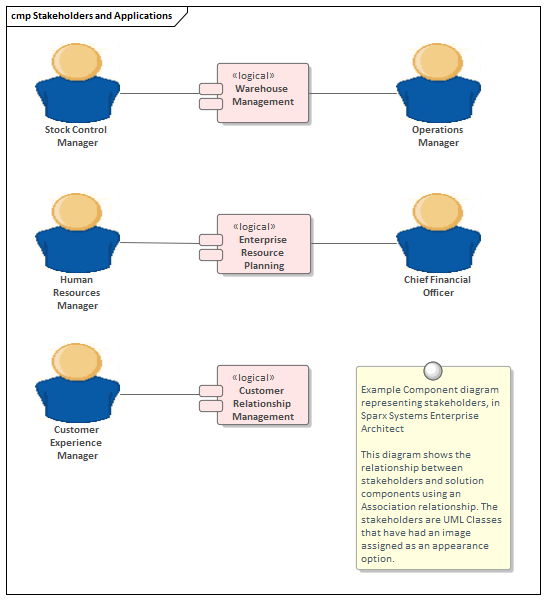 The Class diagram can be used to create visual representations of the stakeholders, including how they are related to each other. 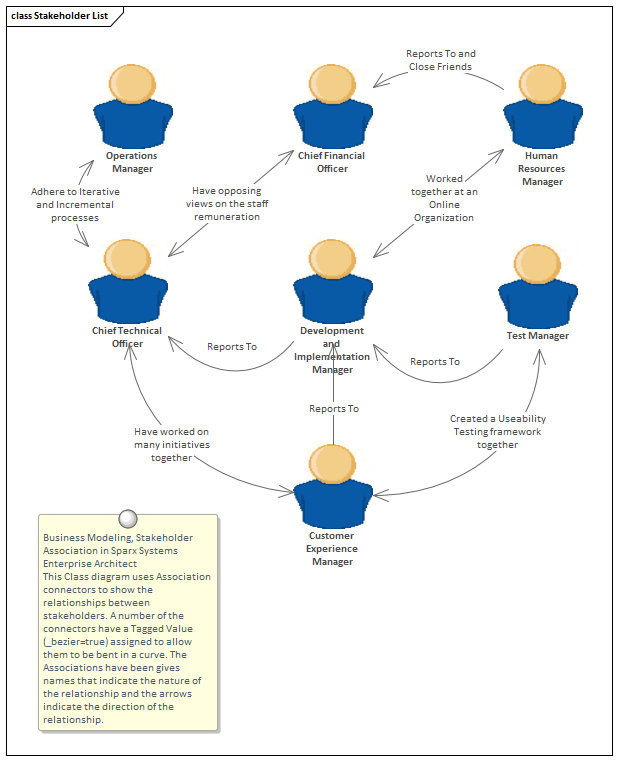 An alternate image can be used to make the diagrams more appealing and to visually represent stakeholder groups. 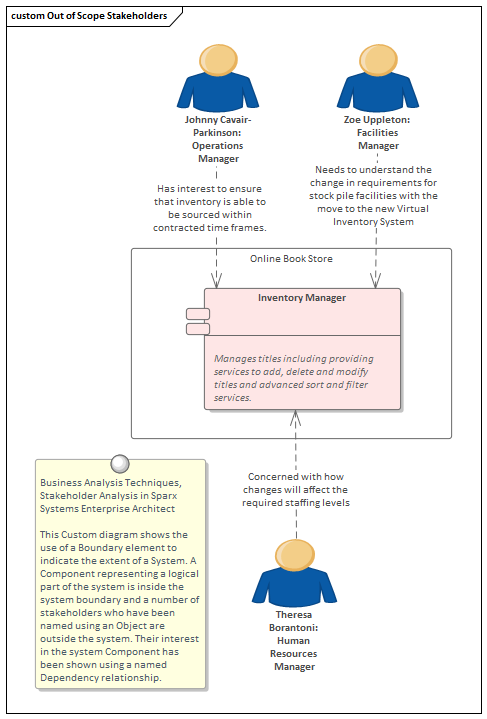 Class diagrams are also useful for presenting parts of the information architecture such as conceptual and logical models. Principles can be displayed and communicated using a Class diagram and their relationships to other parts of the model can be demonstrated. 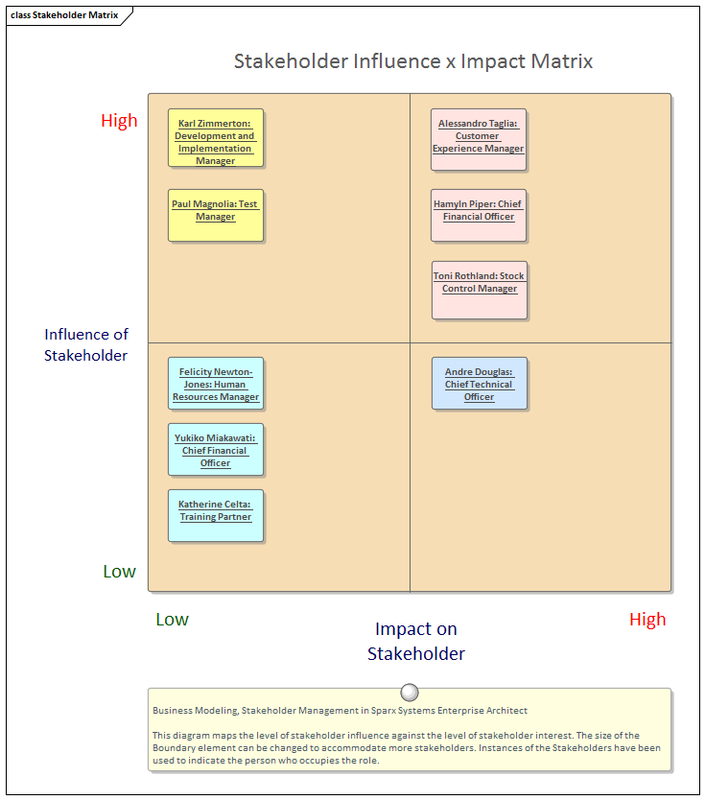 The Component diagram can be used to show the relationship between stakeholders and parts of the solution that affect them or that they have an interest in or a concern about. The diagram could explain the reason for their interest which helps Analysts and others to notify the stakeholders when important milestones are reached. 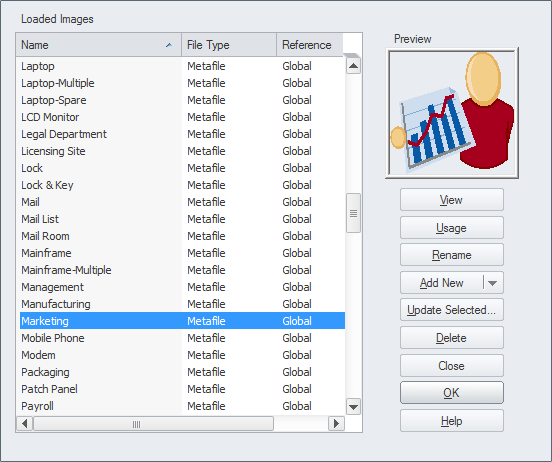 They can also be useful to show any number of Applications or Interfaces in the context of other parts of the architectures. 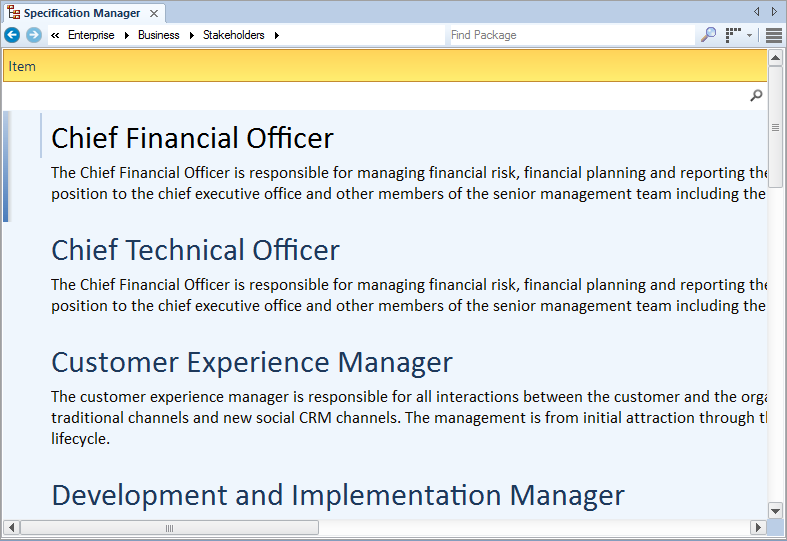 Model Mail can be used to communicate with stakeholders, to alert them of important events that are relevant to them and advise them of outcomes, decisions and required actions. 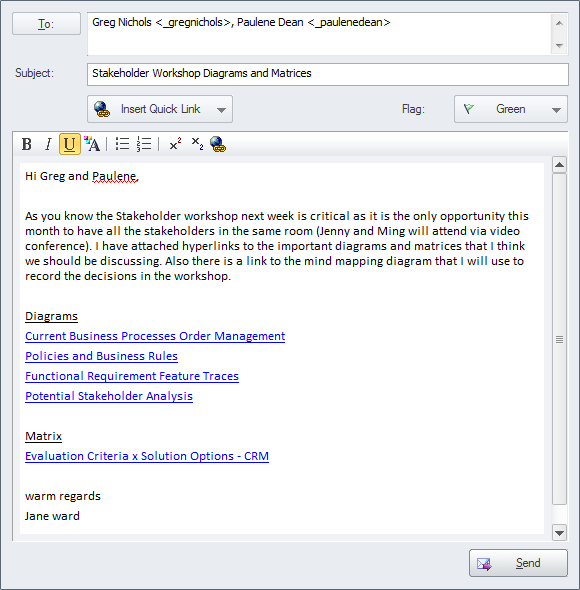 Links to model elements, diagrams, matrices, Team Libraries and a variety of other items can be added to a mail message. The Calendar is a useful tool for communicating information about project milestones and events that will facilitate good communication with the stakeholders. This includes providing hyper-linked references to the parts of the model - including matrices and diagrams - that are of interest to them.